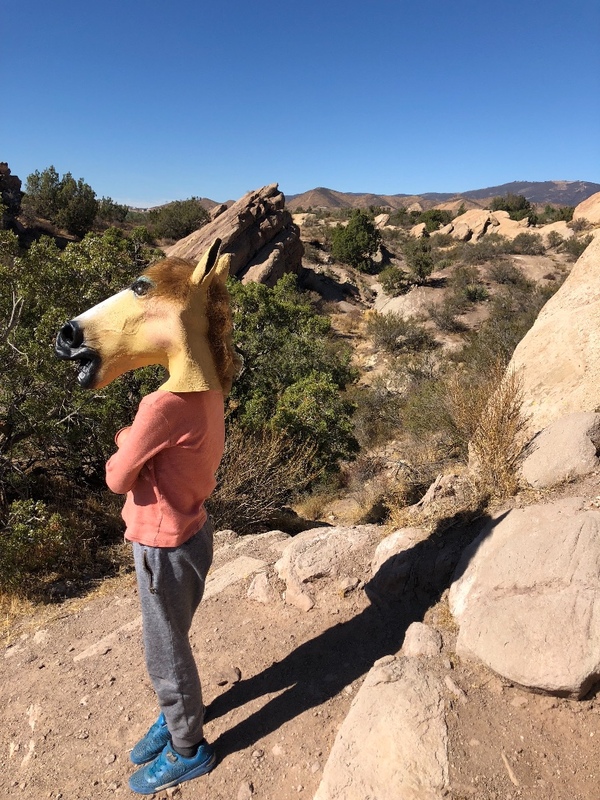 Learning in the Canyons — My Name is Gideon. I have found a new mentor as pictured above. This child horse has been most generous sharing his knowledge. At first I was nervous to learn from a horse child hybrid being, but he's taught me all kinds of things that adults and horses have failed to share including equine teleportive mind melding and how to play Angry Birds with hooves. This is not true of course. I have just lied to you. I apologize. That is simply a human child in a horse mask. I will now tell you some truths. This week I have begun a new course of study with my friend Dave. My horse teachers kinda said "Alright you've got a basic fundamental understanding of some horse things. Now you need to go learn how to take care of yourself in nature so it can be natural to you and you can focus your energies on taking care of your horses." So they sent me to Dave. 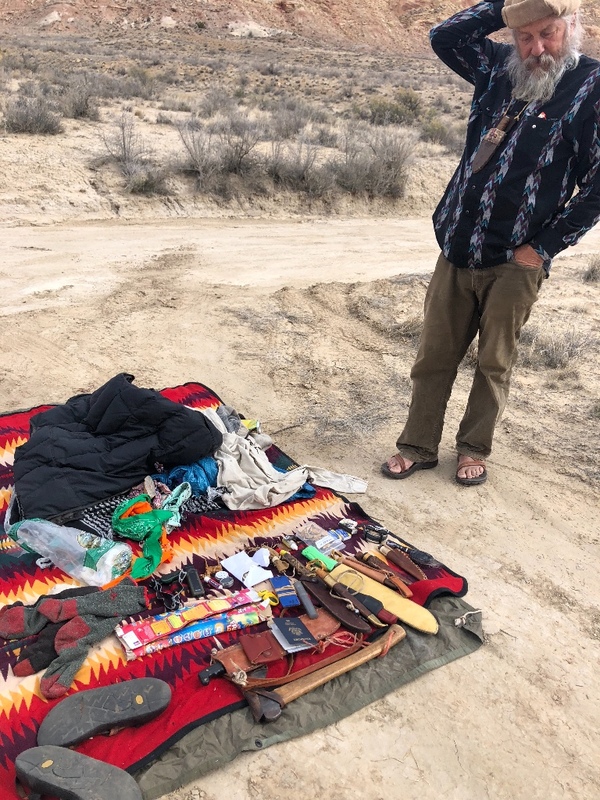 Dave has been living in the mountains and canyons for years, sometimes with and sometimes without clothes, learning to make, eat, survive, discover and wonder about things. I'm a very lucky boy that he and his wife Jill have been sharing their time and knowledge with me. Dave would reject titles like master, wizard, mormon rabbi but all and many more would be applicable. Like many others in this region he knows the secrets of being outside of the built world, not getting dead and having fun in the process. We began by learning the names of the peaks, plateaus, ridges, mesas, canyons and landmark stones and trees. A whole day just generally getting oriented and we covered perhaps 0.0004% of this endlessly vast area and stunningly beautiful area. Dave sharing some different tools and objects used in the walking about modes of being. Dave has a massive well of knowledge and stories. I find myself trying to process the last three things while the next five things are still coming at me, flung like wisdom frisbees that I try to catch with all my limbs and organs, many slipping through to be left strewn on the trail behind us, but I keep what I can. I love spending time with anyone who is expert in anything: purse building, frog catching, hot air balloon maintenance, accounting, oil changes, diction, stamps, tattoo artists, potato farmers, baristas you name it. He's taking my brain and lovingly pounding against the slick rock and into the slot canyon puddles till information lays its knowledge eggs in my ear holes. He is not short a word and has a beautifully child like glee for sharing what he's acquired and experienced. It's a kind of sincere enthusiasm that I rarely encounter. I'd like to learn how to feel that way about at least 5-10 things. Maybe walking around with Dave, getting a little hungry with him, getting a little cold with him, spending the night sleeping on a rock next to a fire we made with a stick, some of that joy and deep curiosity might wear off and stain my brain clothes. Horses used to scare me. Now, through some time with them, I have bullied that fear into a deep respect and awe for their power and sensitivity. The fear is more a practiced caution carried on a bed of respect now. Next in line is the fear of being outdoors without other humans. I like think of myself as a camping type fella, one who enjoys the outdoors and living simply with a can of beans and a used tent from goodwill perched atop some pristine wilderness for unplanned periods of time and solitude. But when I reach to the back of my memory fridge I can't find any of those jars. I've always been with others, depending on there wherewithal to find the right spot, not get dead and have the good tools. I grew up in New York City. When my family would travel to the woods I was petrified of bugs, at the beach I was scared of sharks and sand, in a plane I am always 99% sure its gonna crash, in the dark I hear demons or mountain lions or murderers all of them waiting for the right moment to pounce and eat my face. The stars used to overwhelm me into a catatonia of unanswerable questions. How can space not end? What's after it? And if its several hundred miles of blue marshmallow what is after that‽ You can imagine my relationship to death dying and being dead is not particularly mature or nuanced it is more no no no no no! So where to begin? The dark, the cold, a bit of hunger and disorientation and the company of a friend with knowledge. A lot of folks in these parts bring God with them into the back country. There are many great tales of things going wrong and some astounding good fortune being brought on by some earnest prayer to the lord. I like those stories. I like miracles. I call them coincidences, but whatever the name, I like them. Since I have no God, and therefor no faith in their intervention on my behalf, I feel I should compensate with more tips on what to do. More ways to make fire, more knots, more wild safe things to eat, more understanding of the weather, more awareness about my bodyminds limits and needs, more jokes to tell myself out loud in the harder more devastatingly hopeless moments. I don't mean to suggest I am going where no man has ever gone before. I am not a pioneer. I am simply going where I have not gone before and in that there will be moments of annihilation. I'm desperate for some of that. Most of it will happen in between the ears. Spending time with myself is infinitely more challenging than trying to stay warm or staying on course. I have developed too many habits based on who I think I am. Looking forward to knocking myself over repeatedly in different ways to discover bits and pieces. 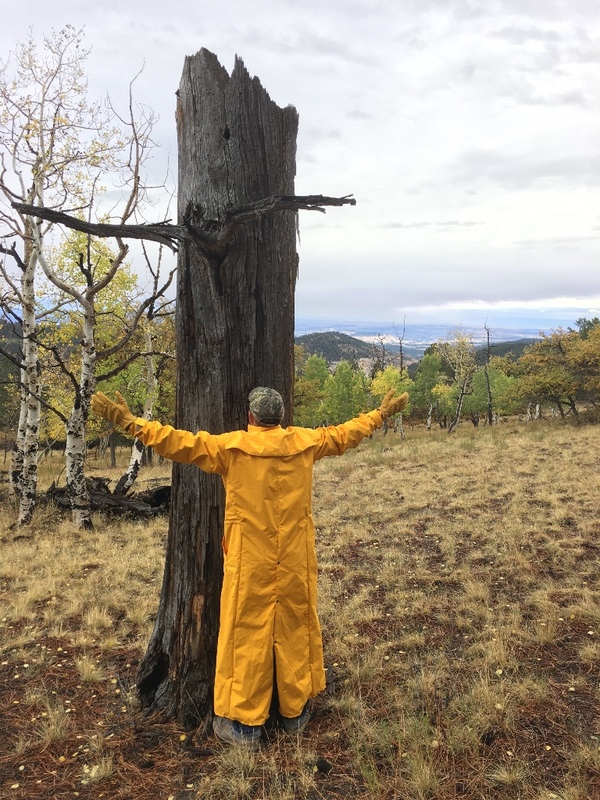 This is me learning about trees while staying dry. Today I begin a walk with Dave. We will travel overnight walking from a place out there back to his home on a creek. We will travel light and stay warm with his mountain truths passed down from the ages. The compass, the maps, making fire, orienting with the stars and the sun these are all things I'm learning so that I am not entirely dependent on my technology. I will also be traveling with some buttons and solar chargers and GPS if I'm spun around. Right now these skills are to be a person with a brain instead of an schmuck just staring at a screen out on the trail. Much more to say. I hope you are being kind to yourself. If you have any questions about life or the afterlife or what it means to be a person please call my friend Keith at 339 502 3613. That's a joke. I made that person up don't call them. You can call me if you want 917 699 3631 though I have no answers to any questions.